I stumbled across a lovely book when I was in town last week and had to have it. It's called 'All Cakes Considered' and is written by an American radio producer who bakes cakes for her office every monday. It's full of tried and tested recipes. If you have never baked before, start with this book. It has a lot of pictures step by step and goes from easy cakes to harder stuff. 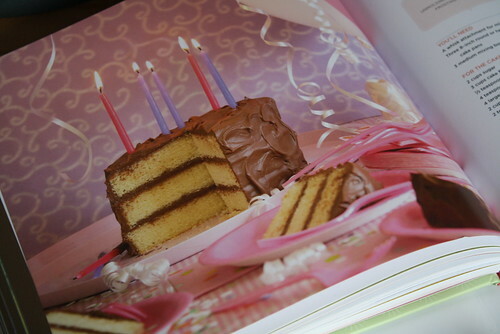 It also has guides such as how to slice your cakes in half, how to achieve the best look when frosting - basically anything you'd ever want to know about cakes. Pair this with beautiful photography and a slogan on the front that reads 'how to keep your co-workers happy, friendly and fatter than you' and it was in my shopping basket before you could say death by chocolate. 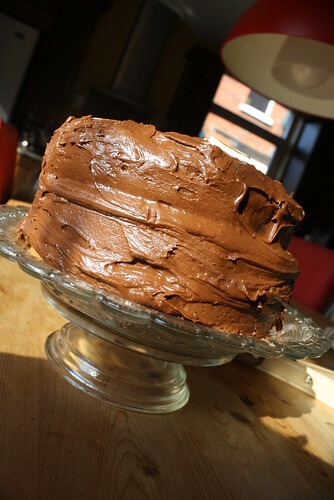 I tried out her recipe for 'Aunt Di's Bittersweet Chocolate Layer Cake' at the weekend and it was such a hit. It is definitely a new favorite. 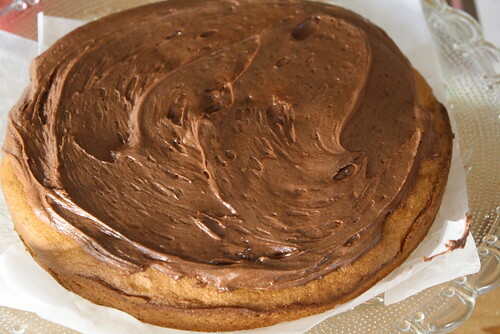 It's a big cake so I might reduce the recipe and make it double layered next time and make it for the family. I made this for a birthday party for a load of 19 year old boys and it disappeared in about 5 seconds (that's why I have no photos of it sliced). Since it was for a group of boys I held back on the glitter and flowers. Just a good old fashioned cake. I took this before the frosting had set properly, but you get the idea. 1. Preheat oven to 175 degrees C (or 375 degrees F). 2. 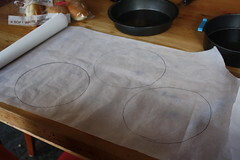 Cut out and attatch baking paper to EITHER three 8 inch tins or two 9 inch tins. I went for three layers. 3. Dry whisk your flour and salt. In a sperate bowl beat the eggs until thick. 4. 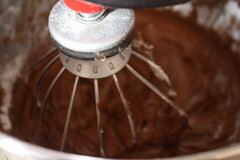 Using a hand whisk or a freestanding mixer whip your double cream until very thick. The book says until it is as thick as cool whip but we don't have that here so I don't know how thick that is! It also says as thick as softened ice cream to give you a better idea. 5. Add the beaten eggs to the cream. Beat on high speed until the mixture is slightly foamy. 6. Slow the mixer down to medium and add the sugar and then the vanilla extract. 7. With the mixer on medium, gradually add the flour mixture. 8. Pour the batter into the prepared pans and bake for 20-25 mins. 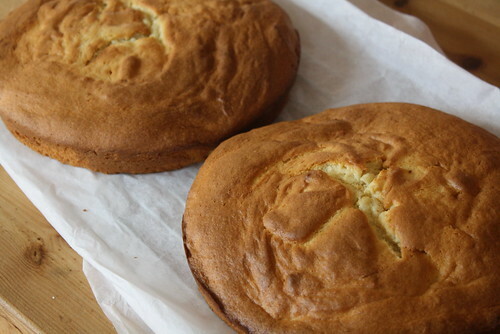 I found that even in my fan oven however the cakes needed about 30 minutes. 9. Check that the cakes are cooked by inserting a skewer (I always just use a fork) and if it comes out clean the cake is done. If it's got any mix on it just return it to the oven for about 2 minute periods and repeat until it comes out clean. LEAVE THE CAKES TO COOL COMPLETELY BEFORE FROSTING. 1. Melt the butter in a saucepan or in the microwave. 2. Pour the melted butter in the mixer and add the cocoa powder. Mix on medium speed until smooth. 3. Add the icing sugar gradually, alternating with the milk. 4. Mix until smooth and then mix in the vanilla extract. 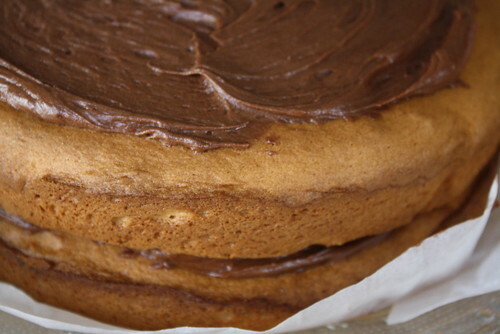 Now all you have to do is wait until the cakes are completely cooked and layer away. I have to say, this is the most delicious frosting I have ever had in my life. So well worth trying! Let me know how it goes if you do! Also, I hope you don't mind me copying out the original cup measurements instead of converting them. You can find many conversion tables by googling but if you want to save yourself the trouble just buy some cup measures, very easy! That book is sooo you! Oh wow, that looks truly delicious. I may add the book to my Amazon wishlist. I love baking for the people at work, it completely satisfies my baking urges and I'm not tempted to eat the cakes because they're usually gone before I get round to it! Oh gosh that looks so yummy, I'm totally going to have to bake something soon! i've seen that book before and i agree! it looks splendid. 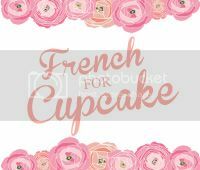 if nothing else, the photography serves as amazing inspiration for amateur bakers like myself! In the frosting, is the milk supposed to be in there twice or did you miss another ingredient and put milk twice? And, how much vanilla? 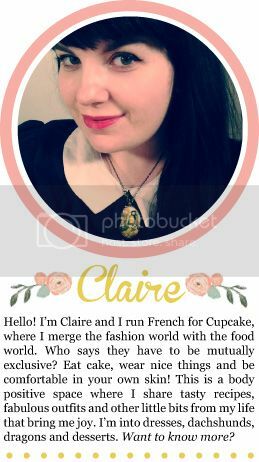 The cake looks great and loving your blog! And the birds were singing to calm us down. River Island introduces a size 18 to their range! Hello from Manchester!...oh wait scrap that. My little sister and I.